Location: Wall Memorial in Nave of the Church (South wall). of Henry Johnson, of Great Berkhempstead, Esq. Mother of the Right Hon C.P.Yorke. Of Vice Admiral Sir J. S. Yorke, K.C.B. And of Caroline, late Countess of St Germans. in the 81st year of her age. In old age most venerable. The beauty of her virtue, or the virtue of her beauty. and the spirit of a roman matron. were of the highest order. were sincere, upright and noble. Her whole life was that of a real christian. Pious without austerity, and charitible without ostentation." And may my latter end be like hers." (a) 'relict' = archaic word meaning 'widow'. (b) Father's name on memorial spelt Johnson. 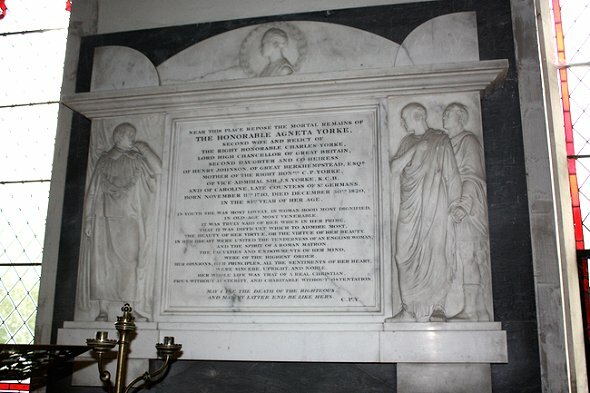 Agneta Johnston  died 30 Dec 1820, interred 13 Jan 1821. Also his wife Harriet Manningham (1763-1854). Location: Wall Memorial in Chancel of the Church. And one of the Tellers of the Receipt of His Majesty's Exchequer. By his second wife Agneta Johnson. And died beloved and lamented March 13th 1834.
of the Isle of Ely. Where his services are still remembered with gratitude and affection. Was decided upon and undertaken. Has furnished this monument to his honored memory." (a) Second wife Agneta's surname on memorial spelt Johnson. in the Hardwicke Family Vault. Also Elizabeth Scot Lindsay (1763-1858) and three sons. Location: Chicheley Chapel (central position). when he succeeded his Uncle in the Peerage. Elizabeth, to Lord Stuart de Rothesay, and Caroline, to John, Earl Somers. He departed this life on the 18th November 1834, in firm reliance on the merits of his redeemer." "The remains of his widow lie interred in the same vault. in the 95th year of her age." who perished by shipwreck, in the Baltic, April 7th 1808.
born July 14th 1797, died April 30th 1810. In the same vault repose CHARLES born August 23rd 1787, died December 28th 1791. JOSEPH JOHN, born August 12th 1800, died March 1801." was erected by Elizabeth, Dowager Countess of Hardwicke." "The Lord giveth, and the Lord taketh away: Blessed be the name of the Lord." 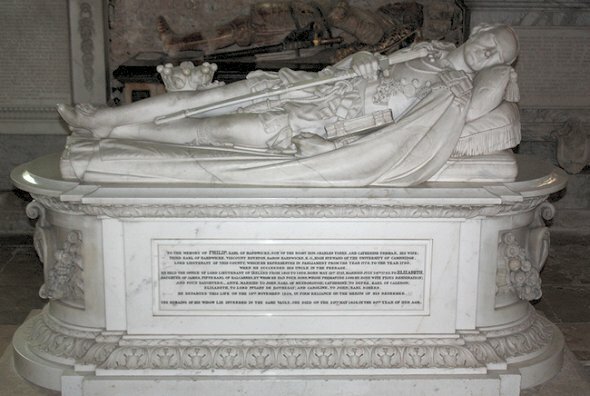 Philip Yorke  died 18 November 1834, interred on 28 November 1834. Elizabeth Yorke  died 26 May 1858, interred on 3 June 1858. Charles Yorke  died 28 December 1791, interred 12 January 1792. Charles James Yorke  died 30 April 1810, interred 6 May 1810. Joseph John Yorke  died March 1801, interred 28 March 1801.
was carved by Richard Westmacott junior and completed 10 years after the Earl's death.